Good News for those Nicki Minaj fans out there who can't get enough of her ! OPI teamed up with Nicki Minaj for a fun nail polish collection. The collection launches 6 new limited edition colors. Pink Friday, Metallic 4 life, Fly, Did it On 'em & Save Me are the fun names of the colors ! 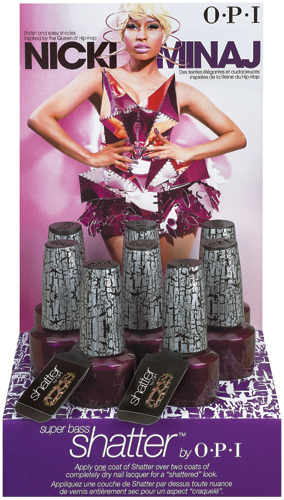 The collection consist out of the typical flashy Nicki Minaj colors and the 'Super Bass' shatter nail polish. The Nicki Minaj collection will be available from february 2012 and will cost 13,95 Euro per nail polish or 17,95 Euro for 4 Nicki Minaj mini's (4 X 3,75 ml). My favourite is this color called 'Fly', which is a very vibrant blue nail polish.